Families need help beyond money and prayers (although money is very appreciated, especially if the family has to travel to a different city for care). I know some people who feel like they are intruding on a busy and stressed family, especially if you do not know them very well, but it’s always better to have too much help than too little. 1. Offer specific help. Try not to say “let me know what I can do to help.” That puts the responsibility back on the family. They are not focusing on their to-do list when it comes to “housekeeping” things – they are focusing on the life of their child. Instead say, “I would like to bring you dinner on Tuesday night at 5:00 pm. Does that work for you?” By being specific, you’re taking the pressure off of the family. 2. Take the lead. 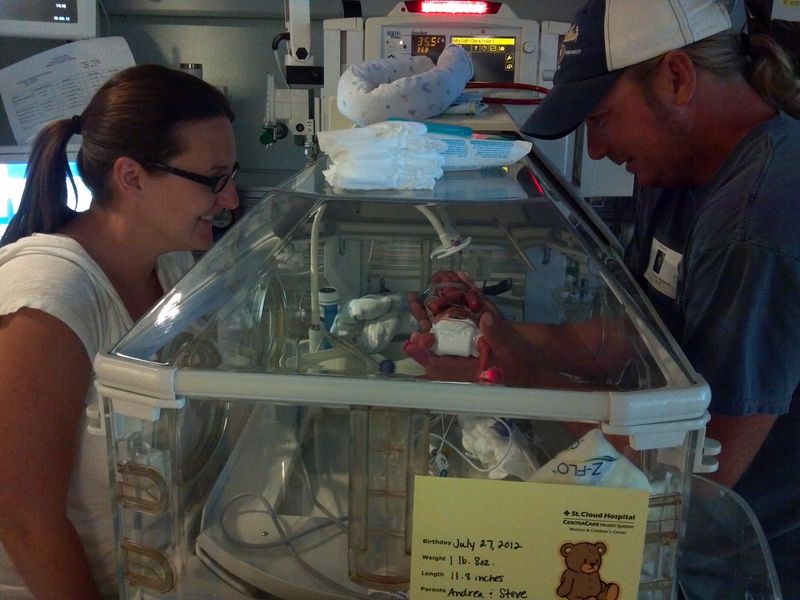 A family with a baby in the NICU is making life-altering decision every day. They are literally unable to make decisions right now that involve “trivial” things like mowing the lawn, walking the dog, cooking dinner, or cleaning the house. If you know the family well, I suggest taking the lead on these things. Just show up with your lawn mower and mow their lawn. Come by when you know they are at the hospital and clean their house. All of these things are life savers to a family that can barely keep their heads on straight. 3. Make meals. Bring some frozen dinners that they can pop in the microwave. (Don’t even ask what they want! Just do it!!) And bring them over in containers that you do not want back. 4. Offer a distraction. Sometimes, families just need a break. Offer to take the parents out for a drink. Bring a movie or a magazine for them to read. Get them a gift certificate for a massage. See if they are up for a walk around the block. 5. Offer to pay for gas. Or groceries, or parking, or lunch in the cafeteria. 6. Ask Grandma or a close friend. Rather than asking the family what they need, you may consider asking a close relative or friend of the family what they need. 7. Babysit. Jax was our first child. I cannot even imagine what it would be like having a child in the NICU with other children at home. 8. Give some money. Sometimes people suggest making a donation to a local charity or organization in honor of the family. I think this is a great idea, but I think that it makes more sense later on down the road. Families need immediate help…if you want to give money it might be more useful for the family at this point to receive a gift card for gas or groceries. 9. Wash your hands. And get your flu and Whooping Cough vaccines. Keeping a preemie healthy is the number one priority for new parents. If you will be a part of their lives, keep yourself healthy, too. Don’t even think about visiting a preemie home if you have a runny nose, cough, sore throat, or any other sick-y feeling. It’s simply not true that preemie babies “need to be exposed” to germs. What are some other things that you have done to help a family in need? Share your ideas with the rest of us! The parents need unconditional love from all the dear and near ones. It is not sympathy what the parents need but lots of love. Absolutely! Thanks for the reminder! I don’t know why this post makes me cry. It must just be that it reminds me of how all-consuming a preemie baby is. And how lonely I felt when he was in the NICU. 😦 Sending big hugs to you!! Ella’s Halo is a great organization to give to, i believe they have a bowl-a-thon coming up too. I will look and post if i can find the info. Gas cards and PARKING PASSES! Paying for parking adds up, even dropping mom or dad off so they don’t have to worry about the miles or the parking is something we appreciated too. Thanks for mentioning Ella’s Halo! Their Website is: http://ellashalo.com/. I couldn’t believe how fast parking added up! These are fantastic suggestions. We had 29 weeker twins, a world away from a 23 weeker but still terrifying, and the best thing anyone did for us was probably my husband’s work giving us a $100 gift card to a local pizza place. It was WONDERFUL to come home after 12 hours at the NICU with our boys and not have to worry about making dinner. There were many nights when without that gift card we would have said “screw it” and just gone to bed without dinner. It’s amazing how even eating becomes too much! How old are your twins now? They will be 1 a week from today! Very well stated. Applies to other situations when families are in a medical crisis. Especially the decision making part. Putting the burden of having to make an additional decision on the family defeats the purpose of your good intentions.